Sometimes, I think the designers at Joules live in my head. They have such a way with pattern and colour, it really speaks to me! I'd love to be able to buy a whole heap of clothes from Joules, but unfortunately, we're on a limited budget. 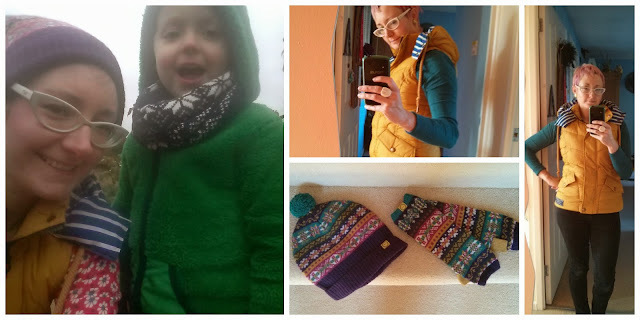 I recently sold a heap of baby clothes, shoes and some of my old clothes on eBay and once my profits were happily in my paypal account, I decided to treat myself to some winter essentials from Joules. If I can't afford to buy dresses, socks and tops from them, I can at least get my winter essentials from them! So, what are my winter essentials? Well, I love a good pair of wellies but my pair from last year are still going strong (they were Joules actually, pheasant print. Adore them!). I have a warm coat.. what I needed was a new gilet/body warmer. I have always loved the ones sold by Joules, so I knew that was going to be my first purchase. Then, to compliment and update my winter wardrobe I decided some knitwear would be a good idea, a new hat and maybe some gloves. Want to see what I chose? I asked for opinions on Instagram at first with regards to the gilet. I loved the colour, a nice bold mustard yellow and the contrasting blue & white stripes inside the hood, but I wanted to make sure people thought it looked OK on!! The consensus was good though. I love the new hat and hand warmers. The hat is really snug and looks cute on. Love the pompom detail as well. The hand-warmers tie the look together. What I really like about hand-warmers is that you can put them over other gloves for an extra layer. I find they work really well over leather gloves because leather gloves aren't too bulky but sometimes they benefit from some extra warmth! There are so many more items I could pick from Joules, but my budget is limited! Are you treating yourself this winter? What are your winter essentials? Linking up with Rachel and Lena for the Passion for Fashion linky. Great color combo!! Thanks for linking up for Passion For Fashion! I want a poncho as I'm pregnant and struggling to fasten a coat!